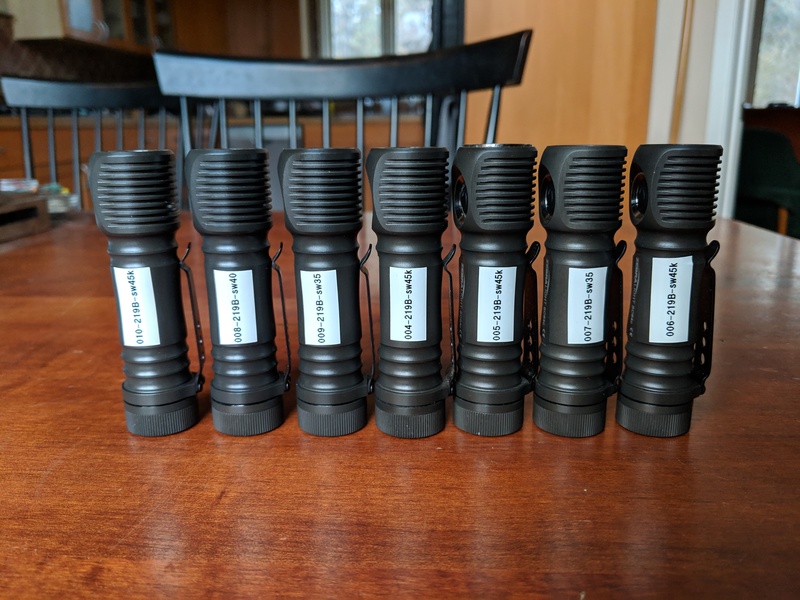 I’m offering for sale the Zebralight SC64c LE with a Nichia 219B R9080 for $150 plus shipping. I first posted about this mod back in September 2018, and I’ve since completed a couple dozen of them. I have sw35, sw40, sw45, and sw45k Nichia 219B available. I would also be more than happy to install any 3V 3535 LED of your choice if you prefer. At the moment I tend to produce these in batches because availability of new lights to mod has been spotty, so please send me a PM if you’d like to purchase one. H1 output with sw35, sw40, and sw45k is approximately 445 lumens, 470 lumens, and 505 lumens, respectively. Mode spacing on the sw45k light I tested is 0.01, 0.09, 0.39, 1.2, 3.7, 10.3, 26.2, 58, 115, 205, 334, and 505 lumens. Since the 219B is a relatively small LED, the beam with a clear lens will be more narrow than stock (much like the old SC62d), with 143m throw for the sw45k version. I include pre-cut d-c fix that can be applied to the lens if desired, which diffuses the beam and lowers sw45k output to ~465 lumens and 104m throw. I can also optionally install a frosted glass lens which has the same output but 90m throw. Here is a tint comparison of the sw35, stock 4000K XP-L2 EasyWhite, and sw45k (left to right). As you can see the stock LED is rather unpleasantly green as maukka discovered in his review, and it also has a fairly poor R9 value at higher outputs. Please send me a PM with your LED and lens preference if you’re interested in purchasing one of these lights. and on the other hand Zebralight is offering your handmade SC64c “Samsung-prototype” that you …. What to do now ??? LH351D isn’t pure white 4000k, you need to put a filter over it to get it down to at or slightly below the bbl. Please feel free to PM me. LH351D will look yellow and maybe very slightly green unless you add a gel filter like twisted raven suggested. You can see the difference between the sw45k 219B and 4000K LH351D in the beamshots I linked at the end of the post. I should also be able to offer sw35 and sw40 in a couple weeks; sw40 would be more neutral and less rosy than sw45k. WOW, that green/yellow tint is gorgeous! Is that the Nichia 219B R9080???????? WOW! The top one is the stock XP-L2, which is pretty green and has a rather ugly corona. The whole point of using an sw45 219B is that it’s well below the BBL and makes colours very intense. AT Viking Pro E21A Quadtrix 6500k 9080, AT Wizard Pro E21A Quadtrix 6500k 9080, Jetusolis 6500k 9080, JetE21A 4000k 9080. PayPal sent, and a bump for this thread. I think it is really special combination. I think you should call it the Bob_McBob Thing_MaBob. Can only use that name once though, so it’d have to be something pretty special. Fortunately, a SC64 with 219B is pretty special. I look forward to holding my Bob_McBob’s Thing_MaBob….wait. I had a bout with a weak back about a week back. could someone enlighten me on the ‘c’ or ‘d’ after the model number on Zebralights? Thanks. It’d be a ZebraLight SC64n, or a SC64b. N for Nichia, B for Bob and 219[B]. I think Mcbob’s Mods has a good ring to it. 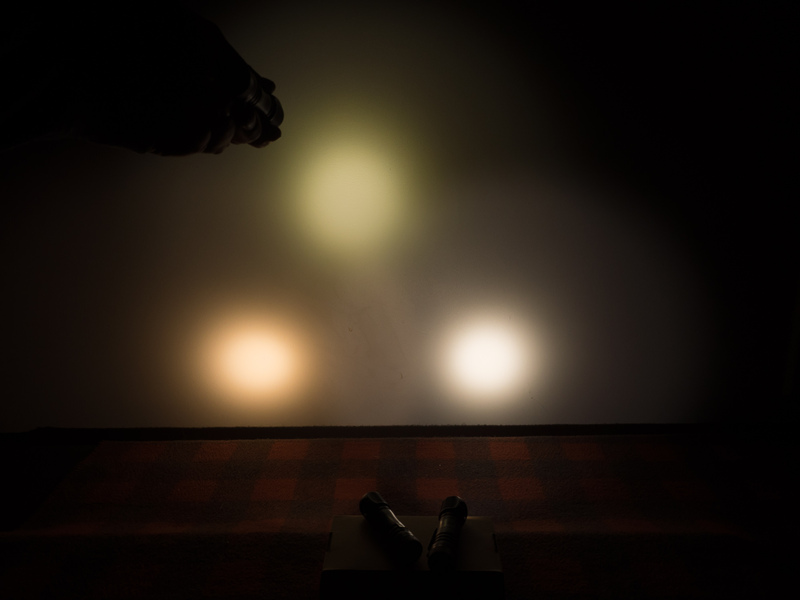 Zebralight uses “c” and “d” for the high CRI models. “C” means 4000K, and “d” means 5000K. Who says heroes are hard to find? A couple updates posted to the OP. Wow, thats a really nice pair of Thing a McBobs! me, I think that sw45 LED is a grail led, it can turn any light into an exceptional light! And you are the first to offer it in a Zebra, which most people consider unmoddable.. major respect. the lucky owners are in for a treat! I carry sw45 in a Novatac atm, it puts my LowCRI HDS to shame.. The LED Makes the Light, much like the steel makes the blade. It’s amazing that Bob was able to mod a Zebralight. 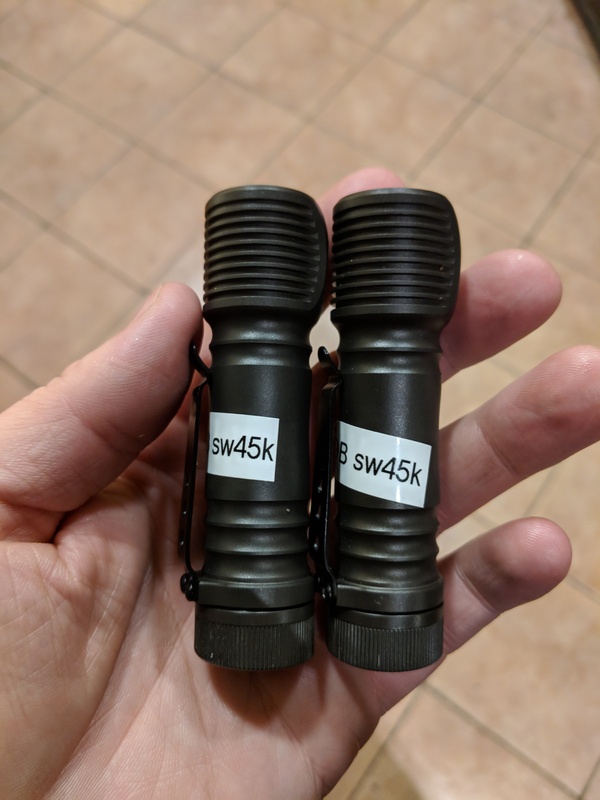 If it was a few months ago when the sw45k 9080 was a discontinued collector’s item, I would have sprang for this and I’m sure plenty of others would too, but after Fireflies offered this same emitter in the ROT66 and the about to ship PL47 headlamp at a price lower than a stock SC64c, it becomes a bit harder to sell even though the $150 really is a bargain considering the labor and the fact it is a Zebralight. Maybe if Bob offers a 4000k 219B or other LED options, there would be more interest. I also have sw40 and sw45 (a more neutral 4500K). 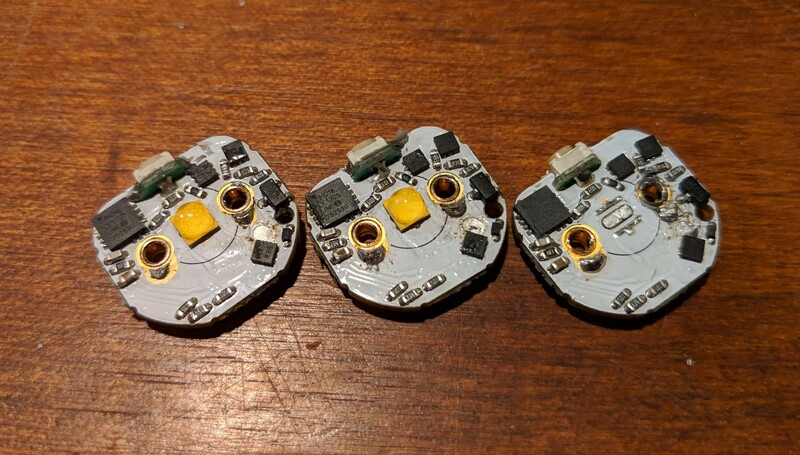 Any 3V 3535 LED with XP-compatible pads will work in the SC64c (XP-L, 219C, SST-20, LH351x), but since Zebralight recently announced a 4000K LH351D version after I posted my Samsung mod, I think the high-end 219Bs are a more interesting proposition. The ROT66 and PL47 are definitely amazing value if you just want some Nichia goodness (until 219B stock runs out). I think the high-end 219Bs are a more interesting proposition. The ROT66 and PL47 are definitely amazing value if you just want some Nichia goodness (until 219B stock runs out). The ROT66 is a great value, and education for neophytes, but answers a question few would ask. The ZL is an EDC, a light you have with you when the need arises. Many might judge the discontinued Eagtac (92+ HiCri sw45 6 LED) MX25L3C thrower to have been more useful, and better built than the FF battery cage torch. Side by side the FF probably shows more pink, but alone, or compared to CREEns and 219Cs, nuances could vanish. Various new headlamp offerings might be considered more practical among the current plethora of gimmick lights. Hobby models may sell well at first, but suffer from short legs. If my eyeballs were younger, or I needed more indoor lights, the lower lumen ceiling sw45 ZL would be great for my uses. As it is, Mr. Wizard has saved me from needless love for a ZL of my dreams, and I can park my pony long from the lemming parade chasing ‘Flies by night’ companies with no track record, or dedicated production facilities, hiding their day jobs with other companies, and carrying Enogear’s spotty pedigree….thanks Bob! Seeing what you have accomplished makes it clear where I would now look for a HiCri pocket pal. Thanks for the update Bob_McBob, I am curious to know how many lights are in this batch. looking forward Sir Bob to mine. First you show us all how to do it, then offer the finished product to those that don’t have the skills, tools, or time to do it themselves! Tedious work, worth the cost for a light ZL doesn’t offer. Sir BobMcBob is onto a very good thing here, carry on my friend if life allows. Bob, you’re pretty awesome. First you show us all how to do it, then offer the finished product to those that don’t have the skills, tools, or time to do it themselves! Tedious work, worth the cost for a light ZL doesn’t offer. These will be cherished. Hey guys, minor update posted. Cranking out lights this week, and they should start shipping next week if all goes well. Thankfully it looks like I’ll be getting in my order of non-sw45k 219Bs in without any major Canada Post strike delays. I’ll be ordering some more SC64cs mid-December to fulfill interest beyond the first batch, so please get in touch if you’d like one. Hard to say because Cree has good and bad tint. Some of the Cree 5A and 5D tint like on the M43 XP-G2 are as nice as the 9080 but without the HI CRI. The one on top is most likely your Cree. The 90CRI XPL2 in the Zebralight SC5c MK2 I had looks greenish like that. But then it can also be the Samsung LH351D and certain batches of the 219C 4000k, which also looks green. Left to right: 219B sw35, XP-L2 Easywhite 4000K, 219B sw45k. I’ve tried quite a few LH351Ds and none have been anywhere near as green as the stock SC64c, but it’s certainly noticeable beside any of the 219B options.